This brief demo is one of the actual lessons being taught from the advanced mathematics textbook by an experienced Saxon high school mathematics teacher in a classroom environment. Using this series, students have the added ability of being able to pause or rewind the video to review specific concepts or steps used in a particular concept or individual problem when necessary. 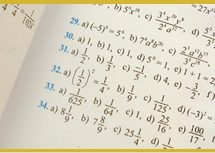 This course covers the last half of the advanced mathematics textbook as well as the first twenty-five lessons of the second edition calculus textbook (through derivatives).